Join us for a month-long dialogue on public health and quality of life as frameworks for waste management in June, 2014. 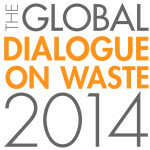 In June, 2014, through four live online panel discussions including some of the leading thinkers on waste, public health and quality of life, we will explore short, medium and long term solutions to waste management for public health and quality of life using examples from selected locations around the world. Join us to hear about and share your own examples on improving public health and quality of life by improving waste management. To stay updated, subscribe to our monthly newsletter or follow us on social media (top right). Acknowledgements: Natali Ganfer is the research consultant for this Public Health & Quality of Life theme, which is a part of the 2014 Global Dialogue on Waste. She structured the panels and helped conduct a survey to choose the panels. Maria Tsakona is the Curator of this theme. She has been involved since this theme was just an idea and made periodic contributions to making the theme possible. She also helped structure the panels and suggested appropriate panelists for each topic. We want to thank Mr. N. C. Vasuki (Former President of ISWA) for his continuing contributions to bridge the waste solutions expertise gap worldwide. He inspired the idea of conducting a discussion on the relevance of sanitary landfills in low and middle income countries. We would also like to thank Dr. Nicolas Escalante (Universidad de los Andes) for continuing to provide inputs through surveys, and Dr. Mario Russo (IPVC, APESB, ISWA), Ann J. Reier (Philips Healthcare), Jonathan Rivin (University of Wisconsin), Nelson Gouveia (Universidade de São Paulo), Andrea Atzori (Bacino PD 2) and Victor Nascimento (INPE) for taking the time to tell us their priorities for this theme. For any other communication, you can write to connect@wastewise.be or tweet to us @bewastewise.